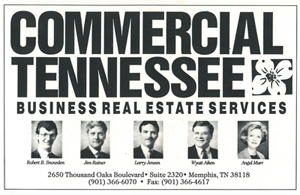 Cushman & Wakefield | Commercial Advisors was founded in 1992 as Commercial Tennessee by Larry Jensen and Wyatt Aiken. Prior to forming Commercial Tennessee, both Jensen and Aiken worked as brokers for the local Cushman & Wakefield office in Memphis. When C&W closed its Memphis office, Jensen and Aiken formed Commercial Tennessee as a full-service, independent brokerage advisory firm that served the Memphis area. In 2002 C&W embarked on its Alliance initiative aligning with independent real estate companies in strategic markets. Commercial Tennessee then became one of the founding members of the C&W alliance program. Members of the Alliance are carefully screened and agree to rigorous qualifications, operating requirements and ongoing performance measures in order to provide consistent, high-quality services to clients. Clients benefit from the Cushman & Wakefield Alliance through shared access to Cushman & Wakefield’s practices, standardized research methodologies and strategic approaches in providing client solutions. Through the alliance program, Commercial Tennessee was able to tap into the vast resources of C&W and gained the ability to offer its clients more national and international capabilities. In 2003 Commercial Alliance Management (CAM) was formed by former Weston employees, Mark Jenkins and Dan Wahl. CAM was formed solely as a third-party leasing and management company that complemented Commercial Tennessee’s corporate strategy of advising and representing tenants. In 2004, Commercial Tennessee began to outgrow its name as it continued to move forward and expand not only its offices and workforce but client base. The company was then renamed to Commercial Advisors to better reflect its national and global capabilities and the manner in how the company represents its clients as they shape their strategies and plan their real estate needs. In 2006 Commercial Advisors was named one of the Best Places to Work by the Memphis Business Journal. More than 80 companies from the Memphis area where evaluated, with 18 finalists being selected. In order to determine the finalists, each company's employees completed an anonymous online survey, ranking factors such as company loyalty, trust in company leadership and faith in the company's continued success. In 2007, Kemp Conrad joined the firm and took over leadership of Commercial Alliance Management. Since that time the company has grown from a portfolio of approximately 3,000,000 SF to over 20,000,000 today. In a real estate led recession, the firm has grown from 13 employees in 2008 to 31 employees today. From 2008 to 2009 alone, the company nearly doubled employees with very little employee turnover. In 2009, Commercial Alliance formed a new Asset Resolution division called CARG (Commercial Advisors Resolution Group) to address the growing distressed asset market and since has dedicated efforts to this endeavor. As a result, CARG’s success has been excellent and led to a strong group of clients which depend on CARG to help resolve problems based upon a deep level of trust in these efforts. CARG is headed up by Vice President Joey Bland. In 2010, Kemp Conrad, Matt Weathersby and Max Aldrich became partners of Commercial Advisors. Also, Commercial Alliance Management was named Small Business of the Year in the 1-25 employee category by the Memphis Business Journal. 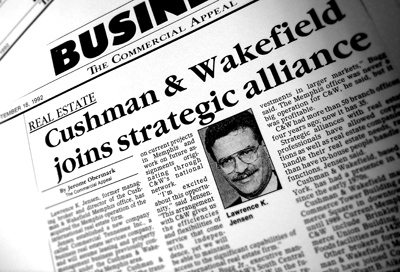 In 2011 Commercial Advisors changed its name to Cushman & Wakefield/Commercial Advisors (CW|CA), and Commercial Alliance Management changed its name to Cushman & Wakefield | Commercial Advisors Asset Services. This change fully capitalized on the strength of the global Cushman & Wakefield platform, demonstrating Commercial Advisors’ strong ties to the world’s largest privately-held real estate firm. The name change also creates clarity, consistency, and connectivity between the Commercial Advisors and Commercial Alliance brands. The Commercial Alliance logo, signs, website, flyers were changed to Cushman&Wakefield/Commercial Advisors to allow the two local companies to streamline their brand identities and eliminate confusion in the market. Also in 2011, CW|CA further expanded its services by launching Farmland Advisors, a new land brokerage division that focuses on agricultural, recreational and timberland properties in the Southeast and Midwest. In 2011 alone, Farmland Advisors represented buyers of approximately $17 million in farmland, timberland and hunting properties in the Southeast. Today Cushman & Wakefield | Commercial Advisors operates in Tennessee, Arkansas, and Mississippi as well as across the nation and around the world through our alliance with Cushman & Wakefield. Since 2003, CW|CA has completed office, industrial, retail and land transactions totaling more than 30 million SF via the Cushman & Wakefield network. The staff at Commercial Advisors is dedicated to providing first-class commercial real estate services in office, industrial, farmland, land and retail real estate. Our areas of expertise include: brokerage, leasing, property management, due diligence, project management, incentive analysis, receivership and more. Commercial Advisors Asset Services is one of the leading third-party real estate provider in the Memphis region with a portfolio of more than 25 million square feet. Cushman & Wakefield | Commercial Advisors has more than 21 brokerage professionals and 70 employees. Our professionals are among the best in the Mid-South and have received numerous awards including the prestigious MAAR Pinnacle Award, CoStar Power Broker, Commercial Broker of the Year, Office Broker of the Year, Land Broker of the Year, and more. CW|CA stresses continuing education and many of our professionals carry the SIOR and/or CCIM designation. CW|CA takes pride in its deep community commitment as evidenced by the priority set for each employee to get involved in the community - even on company time. As a result, the employees of CW|CA are actively involved in more than 36 local non-profit organizations, filling many leadership positions within the community.